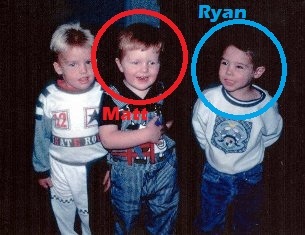 Matt and Ryan have been best friends since the beginning of time (A.K.A. 1986). We have all sorts of things in common, such as our love for food, our thirst for knowledge, our devotion to our God, and we also share the same grandma! As children, we were separated by what seemed to us a HUGE distance, but we were still able to keep in pretty good contact. 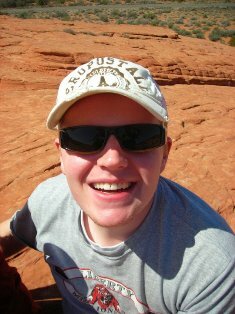 Another cousin/best friend, Jake (Seen in the “before” and “after” pictures) has also been a huge part of our little gang. Together, we three have terrorized neighborhoods, eaten through mountains of awesome home-cooked meals, and scattered broken lasagna noodles all over the kitchen floor at Ryan’s house. Time and experience tend to stop a person from breaking uncooked noodles all over the floor. For Ryan and Matt, that experience came throughout our high school and college careers and especially as we took two years off of college to serve ecclesiastical missions in South Korea and Salt Lake City, Ut (respectively). It has been our great blessing to be raised by loving and devoted parents who taught us values and a love for food! 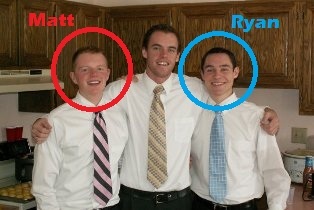 Both Matt and Ryan are married to their true best friends with whom they can’t wait to spend eternity. Ryan is a lover of all things edible. Except salmon… Call me crazy, but I cannot stand the stuff! It smells good, looks great, and I’m sure it tastes wonderful too… I blame it on the home-caught, home-cooked salmon that grandpa fed me with the bones and scales still attached. A wonderful delicacy, but a little bit much for a five-year old. My beautiful wife of two years and counting, Julia, is the brightest part of my life. I’ve gotten so used to the “how did YOU manage to get HER to marry you?” comments that I don’t even bat an eyelash anymore. In fact, the more I learn about her the more I agree with the assessment. I’m a proud member of the United States Army National Guard and have spent time in both Afghanistan and Iraq, where I learned that just because the restaurant isn’t clean, it doesn’t mean the food isn’t edible. Partially due to the deployments and partially due to my time in Korea, I am CRAZY for exotic foods. P.S. As a side-note, Ryan recently found a Youtube video that made him laugh his face off. It’s called Kid History. Click Here to Watch it. 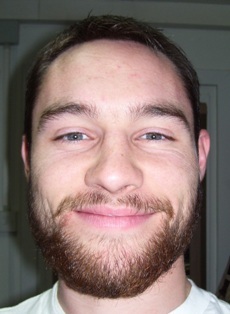 Matt thinks that Ryan’s beard (shown above) is quite epic. He wishes he could grow one half as manly as that one. Beards aside, Matt DEVOURS most food. Sometimes, he wishes he didn’t enjoy eating as much as he does – entirely because of the ensuing weight gains. But, that thought is quickly destroyed by the nightly dinner masterpieces his wife Alisha makes. Yes, he is super lucky to be married to a culinary wonder. More than that, he is super lucky to be married to one of the best people he has ever met. If he makes it back into his loving Heavenly Father’s arms, he is certain it will be because of Alisha. Matt and Alisha are blessed with an extraordinarily exceptional 2 year old son named Ian. Ian brings an extra large amount of joy, happiness, energy, laughter, and work into their home. …And as a nice post-script… We belong to a faith that believes in allowing all men and women “the privilege of worshiping Almighty God according to the dictates of [their] own conscience”. However, it would be selfish of us not to at least give you the opportunity to experience the happiness that a faith-filled, value-based life can give you. If you’re interested in learning more, please click on the picture below.